Each player is responsible fo r resolving malfunctions in their own sector, and you'll have an arsenal of space tools to work with. And if that wasn't hard enough, you 'll also have to deal with anomalies, which often require the coordination of the entire Spaceteam. Your Spaceteam has 5 minutes to complete your repairs, so act fast and good luck! Captian Out. 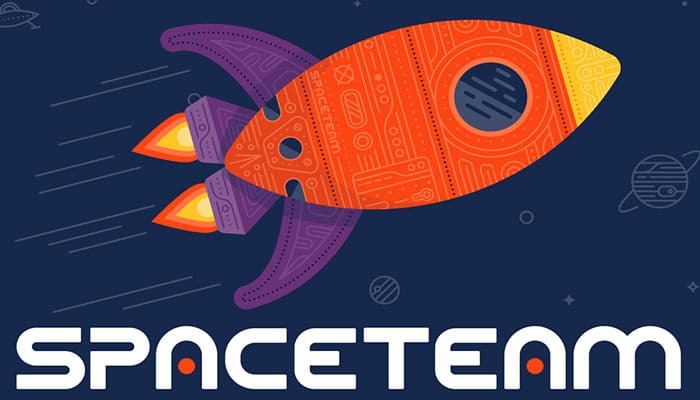 Spaceteam is a cooperative game, and all Players win tog ether or lose together. 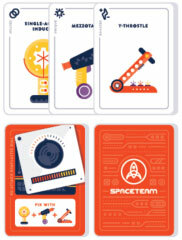 Players win the game if they collectively uncover and assemble all 6 Systems Go Cards before time runs out, but lose if they are unable to accomplish the objective. Set the timer for 5 minutes and place in the center of the table. Separate the Tool Cards (blue backed cards) from the remaining cards, and divide the Tool Cards roughly equally among all Players. Players may look at these cards and should hold them in their hands. All Tool Cards must be used regardless of the number of Players. Separate the Malfunction Cards, Anomaly Cards, and Systems Go Cards, (which all collectively comprise your Malfunction Deck (orange backed cards)). Set up the Malfunction Deck according to table below for player number and desired difficulty, then add the 6 Systems Go Cards. Set aside the unused cards. These will not be a part of the game. After assembling the Malfunction Deck, shuffle the deck and divide the cards roughly equally among all Players. Players may not look at these cards, but should keep the deck in their immediate playing area. Start the timer and each Player flips over their entire Malfunction Deck, revealing the bottom card only. Everyone plays and and shouts at the same time; there are no turns. Players must resolve malfunctions and anomalies one at a time from the top o f their Malfunction Deck. After a card has been resolved, the Player discards the card face down in an adjacent discard pile. Players resolve Malfunction Cards by placing all necessary Tool Cards face up directly above the Malfunction Card. Each Malfunction Card indicates the tool(s) and/o r tool-type(_) needed in the 'FIX WITH' box. The tools needed are indicated by either name, image, or tool-type icon. After a Malfunction has been resolved and discarded, the Player picks the used Tool Cards back up and continues play. Players resolve Anomaly Cards by performing (or having the group perform) a necessary action as indicated by the card. After the indicated action has been perform ed, the Player discards the Anomaly Card and continues play. Systems Go cards indicate that a particular system o f the Spaceship is repaired and running smoothly. When a Systems Go Card is revealed, the Player must loudly read the caption (i.e. NAVIGATION SYSTEMS ARE GO!! ), and place that card in the middle of the playing area. There are 6 Systems Go Cards, which each comprise a piece of your Spaceship, and collectively result in winning the game. There is only one of each tool on the Spaceship, and these tools are spread among all Players. Each tool is also categorized by tool-type, which is indicated by the tool-type name (i.e. Booster, Atomizer, etc). and an icon in the to p left corner of each Tool Card. Players must learn to effectively share their Tool Cards with other Players in order to repair the spaceship before time is up. Tool Cards may only be handed to a Player directly adjacent to you, and may never be directly handed across the table. Once a Tool Card is placed above a Malfunction, it can not be removed or used elsewhere until that Malfunction has been resolved. A Player may not place more than 3 Tool Cards on the playing surface at any given time.